A salient feature of modern poetics is its direct connection with cultural history and politics. Among the great American poets of the twentieth century, Wallace Stevens and William Carlos Williams offer a significant contrast with T. S. Eliot and Ezra Pound. Where the latter advocated a theocentric or reactionary response to the cultural crises of modernity, the former affirmed an essentially humanist and democratic social and aesthetic ethos. 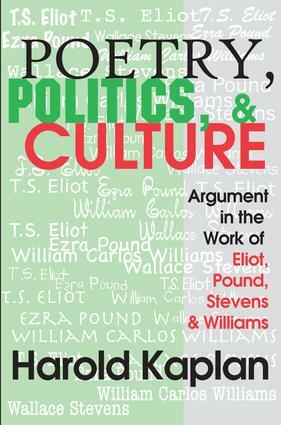 In Poetry, Politics, and Culture, Harold Kaplan offers a penetrating comparative study of these representative and distinctively influential poets.All four poets wrote in an atmosphere of cultural crisis following World War I, caught as they were between outmoded belief systems and various forms of artistic and political nihilism. While each believed in poetry as a source of cultural values and beliefs, they nevertheless experienced loss of confidence in their own vocation in a world characterized by scientific, rationalist thinking and the mundane struggle for survival. For each, therefore, the poetic imagination was a means of restoring order, or building a new civilization out of chaos. In trying to define a revitalized culture, the four exemplified the perennial quarrel between Europe and America.